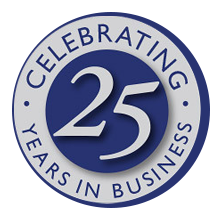 Speed Reducers – RJ Link International, Inc.
Rj Link Speed Reducers are manufactured in numerous sizes for a variety of products and markets. All gearboxes are custom built. Application dictates components. Most use tapered roller bearings, helical or spur gears, customer specific yoke or flange connections. A cast housing with flexible mounting connections including SAE bell housings or flange connections, a variety of ratios depending on your application, engine or anti-engine rotation, this gearbox is well suited for pump related applications. 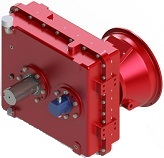 A cast housing with flexible mounting configurations including SAE housings or flange connections, a variety of ratios depending on your application, engine or anti-engine rotation, parallel output shaft design. 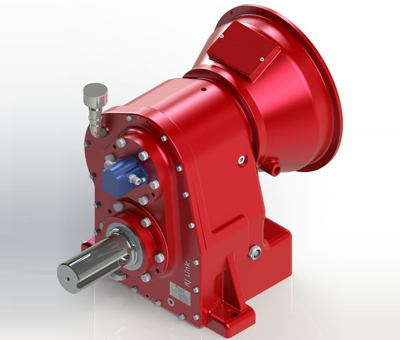 This gearbox is particularly well-suited for pump applications. A fabricated housing, optimized for space, this engine rotation gearbox is ideal for mobile applications where size and function are critical to the overall design. An aluminum case (similar to the D101), extra width for additional input and output shaft configurations and positions, increased sump size for higher horsepower and cooling capacity. A ductile iron housing, various input and output shaft configurations including straight shaft with key, tapered shaft and agricultural PTO connections, engine or anti-engine rotation. A fabricated gearbox for mounting flexibility, this gearbox is designed to be mounted and operate at angles up to 30 degrees, engine or anti-engine rotation. High horsepower capability, a fabricated housing for increased design flexibility, precision ground gears for heavy loading and long life, limited mounting options, engine or anti-engine rotation available. Precision ground gears for increased capacity, a ductile iron housing with the flexible mounting connections including SAE bell housings or flange connections, a variety of ratios depending on your application, engine or anti-engine rotation. A cast housing for anti-engine ratios up to 5 : 1. Engine Max. horsepower 600 HP. Center Distance 12.2″. Designed for horizontal mounting. Overall size 34.5″ W X 31″ H. Typical weight 1,550 lbs. with an SP314 clutch.